The 19th century was a wonderful time for industrial development and social change but it is difficult to obtain factual accounts about the ordinary people of Brighton that did not in some way also reflect the bias of a more literate, upper and middle class. It was a relief therefore to find archive material written by Edward Cresy, a young London born engineer, who the passage of time has now pushed into obscurity. Cresy had been employed to survey the worst areas of Brighton for The Board of Health, and his primary focus had to be on the areas inhabited by those with little or no income. His report back to the Board detailed how these citizens of Brighton were forced by their poverty to cluster into large family groups in the town's less desirable and often unsanitary accommodation In my opinion, Cresy's report is one of the most truthful and revealing accounts about Brighton's working class to be produced during the early years of Victoria's reign. Within his report, Cresy produced maps of the specific areas of Brighton where in his words," the humbler classes lived," and pinpointed where diseases prevailed, suggesting possible causes for those sicknesses. As the illustration of Carlton Row reveals, he found many relatively new buildings were already in an advanced state of decay with householders taking in washing to supplement incomes and noted that domestic waste, which could include vegetable peelings and the intestines of fish, was often being strewn onto the cobbled courtyards where it would decompose in the strong sunshine to give off noxious odours. Even carcases of dead cats and dogs were left there to rot! His report entitled "Report to the General Board of Health on the town of Brighton"
itemising his findings in idividual streets makes compelling reading, but in the copy below I have separated the street name from the text and made slight alterations to the report itself in order to overcome Cresy's copious use of unnecessary punctuation and some aspects of the Victorian terminology. So before using verbatim quotes in any other works, it is strongly recommended that you inspect pages 10 -18 of Cresy's actual report. Pages 10-17 of Cresy's "Inspection of the Worst Condition Houses"
Kings Road. The houses have got cellars. In one house belonging to Miss Ballard the water cannot be got rid of except by emptying into the gutters of the streets. Three Tuns Court. Densely peopled. The well is 35 feet deep and the very bad drains are all on the surface and pass under Hudsons bake house in Little East Street. Little East Street. 16 or 18 persons have one pump in common and keep it in repair. Kings Road. No. 18, Mrs Moons house, has a basement story, at the back of which is a cesspool belonging to other premises. The contents of this cesspool ooze through the wall and are very offensive. The lodgers have left the house in consequence and when in the occupation of the former tenant, Mrs Smith, it was equally bad. Mays & Smarts Court, and Market Street. The two houses Nos 31 & 32 have a privy in common, close to the windows of the dwellings. Saunders Court. About 12 feet in width, has 6 houses and the water supplied is very turbid. There is but one privy and that is in very bad condition. The cesspool has not been cleansed for 5 or 6 years. Poplar Court. The privy is over an offensive cesspool. Lewis Court. Seven feet wide. The pavement is maintained by Mr Lewis, but the cleansing is done by the Town Commissioners. Duke Street Court. The houses are all built back to back, consequently there is no ventilation. Middle Street. Has similar courts, and the same supply of water from the wells. West Street. Has the water from Smiths Brewery running along the channels of the road, there not being any sewer. Bunkers Hill. 12 small houses, chiefly inhabited by fishermen. The water is good from the well but the privy is over an ill contrived cesspool. Shuter's Gardens. 12 or 14 houses with one privy. The court is small and not drained. Little Russell Street. consists of four roomed houses. They are badly supplied with water. There is a well but no bucket or rope. There are several pigs kept in this neighbourhood, and slaughterhouses extend along the backs of several houses which are highly offensive. Great Russell Street. Several courts branch out of this street . The houses consist generally of only two rooms. They are infamously drained, and the well has neither bucket nor rope and most of the wretched inmates procure the water they use from The Kings Head public house. Suffolk Place. suffers from the pig yard belonging to Mr. Barnett. The only drainage consists of open channels by the side and they are in a filthy condition. Artillery Cottages. No. 3 is occupied by Mr Benton, has 6 rooms for which he pays £16 per annum. At the back his neighbour has pigs, which from the yard in which they are kept, being on higher ground, are a great nuisance. Mr. Wood's pig yard is in a filthy condition. Suffolk Cottages. On one side is a yard in which were 17 pigs, among them, 7 breeding sows. Several cottages which let for 3/6 per week, are within a few feet of this nuisance. The inhabitants are always in an ill state of health. The 8 roomed houses let for 6/- per week and the wells are 30 feet deep. At number 13, the soil of the privy overflows into the cellar. Suffolk Street. No. 38 is also in a wretched condition. There are 8 houses and two privies, cleaned out once in 2 years. There are 96 families in 40 houses in this neighbourhood and all of them working class. Upper Russell Street. The courts, right and left, are of the same character. Clarence Street. The square drains are all bad. Marlborough Street. There is a cow shed and all the sullage is turned into an old well, and in consequence, the water in the 17 wells below is seriously effected and certainly not fit for drinking or any culinary purpose. Circus Street. One of the gentlemen in attendance observed that the wells were from 50-60 feet deep and that they were all used as cesspools. The water used was supplied by the Company. Regent Row. No. 12 is a beer shop kept by Mrs Miles. The well, upwards of 100 feet in depth, is now converted into a cesspool, and consequently the water in the neighbouring wells is much injured. Ayr Street at the angle is very filthy. There are several slaughterhouses in this neighbourhood. New Dorset Street. is imperfectly drained. North Lane. The streets, which communicate on both sides, have their drainage bad. The privies of all the houses are much complained of and the tallow melter's yard at the corner of Spring Gardens and North Lane is a source of great annoyance. Foundary Street. A collection of bones, rags and other refuse on these premises is much complained of. Pimlico. The two roomed houses, let at 1/6 per week have no water supply. The privies are bad and the cesspool is very deep and seldom emptied. Fever rages here frequently. St Thomas Street. has a gutter in the middle. North Lane. At the bottom are several slaughterhouses. Vine Street. Several shambles and slaughterhouses which discharge into the street. Cheltenham Place. is a small alley with houses back to back. North Lane Passage. Is very dirty and unhealthy. There are four houses built back to back let for 2/3 per week. Several of the inhabitants were suffering from fever. The well is 16 feet deep and the cesspools flow into it. Gloucester Lane, Square, Cottages & Terrace. All in the same bad condition. Little St James' Street. 9 feet 3 inches in width. The houses are small and let for 2/- per week. The rooms below are 12 by 10 feet, with a back yard about 4 feet deep, in which is the privy, directly adjoining the window and near this is the well that supplies the houses with water. Rock Street. The houses have 4 rooms let for 4/6 per week. The yards at the back are only 8 feet deep and in them all is a privy badly arranged, and close to the window. The well which supplies them is 60 feet deep and the water is said to be hard, but was not complained of in any other particular. At the end of this street is a dyer, whose well is 70 feet deep. There are altogether 29 houses and the two at the end are very bad as respects their drainage. St James' Street. The Chimney of the Brewery was complained of. Grafton Street. has a pump belonging to the Commissioners and a well 60 feet deep. The water which now stands in it is 16 feet. The engine has a wheel driven by 2 horses which pumps the water into a cistern above, the dimensions of which are sufficient to hold 2,500 cubic feet of water. The three pumps and machinery are reported to be in good order, and the quantity of water above mentioned can be pumped up in 6 hours. The water is used for watering the streets. Upper Bedford Street. The five houses generally have 3 rooms and each house lets for 2/6 a week. Sluggers Buildings. These dwellings are sensibly affected by the pigs kept in the yards of the houses in Laurel Row. One house is now occupied by Mrs Martin and five children and the whole family are suffering from sickness in consequence of the ill drained condition of the house. The stables which adjoin are very offensive and the matter oozes through her wall. In this narrow confined place the wet linen was suspended upon lines, trained across the yard to dry and the medical gentlemen in attendance remarked that nothing could be more injurious to health, the linen being rarely properly washed and possibly still retaining much that would be injurious to infantile lungs as it passed off during the process of drying. Laurel Row. has 29 houses all of the same character as the last. Essex Cottages. Ten in number, are all in bad condition and fever is now prevailing. Scarlet fever is always present in the spring and autumn. Crescent Cottages. which have their entry from Upper Bedford Street are let at 1/6 a week. There are 34 houses, 29 are occupied. The 4 privies are in a bad state and require emptying. Manchester Row. The yards at the backs of the houses are not more than 2 feet 8 inches in depth and the privies are close to the houses. At number 7 the sister and brother of the occupier had died of fever and the mother was not expected to live from the same cause. These two-roomed houses are let at 2/6 per week. Paradise St. & Row The pigs are much complained of and the privies are out of order. of refuse and filth. The cesspools are bad. Nottingham Street. has the same number of houses and is in the same condition as the last mentioned, indeed if possible, exceeding it. Leicester Street. Houses which back towards Egremont Place are all affected by the privies, which being on higher ground, the contents soak through the party wall. Pigs are kept by several of the inhabitants of this street. Egremont Place. has about 41 houses of a better character. At number 30 is a well 120 feet in depth and is similarly placed to others, in the fence wall, supplying 2 houses. The cost of sinking these wells is between £9 & £10. The water was not quite clear and the labour of working the engine was complained of..
Paradise Cottages. About 20 in number, have a narrow yard, about 4 feet in width, in which the privies are placed. Devonshire & Grosvenor Street. The houses all receive their water from wells, which are partially affected bythe matters that drain into them. . Privies here very bad indeed. Chesterfield Street. The inhabitants have suffered much from Typhus, particularly those near the slaughterhouse. Privies here very bad indeed. Thomas Street. Abounds with lodging houses. The drainage is bad, water indifferent, and the privies of this and the two former streets is very bad indeed. In the cellar is a privy, which serves for the use of 14 houses and the water in the well, which is close by, is not fit for use. Cumberland Place. Has 56 houses, supplied with well water and all the privies are over Cesspools. George Street Gardens, Dorset Street, & William Street. are all deficient in drainage and badly supplied with water. Their privies are generally contiguous to the well. Carlton Court. No 4: the privy is in the yard. The basement very badly situated and at the upper end of the court are several sites, in which were 19 pigs, in a very unclean state. This court has a wide open piece of ground in front of the present houses which is now advertised to let for building purposes, leaving a passage only 4 ft wide to the last mentioned houses. There is no authority to prevent its being built upon. Carlton Row. There are 51 houses with an area or yard about 8 feet 6 inches wide, on which the privies etc are arranged. Several of them are in a very bad state. In one of the yards a small house has been built. Fever rages in this locality. Several of the houses are mere ruins and others are in a miserable condition. Woburn Place. The road is 3 feet above the level of the one-pair floor of the wretched habitations in Carlton Row. The wells are in the lowest part and 35 feet deep. At no 118 is a double privy and a cow lair which drains into an old well, which is never emptied. This double privy is used by most of the dwellers in this street, from their own being in so bad a state. Carlton Hill. At no 80 the well is 35 feet deep and the yards being 10 feet below the level of those in Henry Street, the drainage and soakage of the privies come down into the rooms and ooze through the walls. Nelson Street. has 58 houses. At no 33 the well is 36 feet deep and the water is turbid. Riding School Lane. has an offensive slaughterhouse at the bottom where there is a large cesspool to receive all the offal. This is reported to be 80 feet deep and never needs emptying. St John's Place. has 18 houses, the inhabitants of which are reported to be very unhealthy. The situation is high, but the yards in which there are privies, have no drainage whatsoever, they are covered with filth, and only 5 feet wide. These 4 roomed houses are let for 3/- a week. At the time of the inspection, smallpox was prevailing in them. Sussex Terrace. The chimney of a pipe manufactory is greatly complained of from the quantity of dense smoke it occasionally discharges. Ivory buildings. The piece of ground between these and the houses in Woburn Place. is covered with pigsties and several abutting upon Sussex Street are dreadfully offensive. There are 52 houses in Ivory Buildings and the cesspools in the courts are trapped imperfectly. Fever is very prevalent. Cambridge Street. The inhabitants keep pigs which are in a filthy state. Richmond Street. The inhabitants keep pigs which are in a filthy state. Albion Street. has 70 houses all having privies and filthy cesspools. At the back are several piggeries. Richmond Mews. Twenty one houses with similar conditions to Albion Street. Richmond Square. Thirteen houses with an old well turned into a cesspool. At No. 8 there was scarlet fever and the house upon examination abutted against a cesspool, the contents of which were oozing out close to the fire place. The walls had been battened to conceal it. Hanover Street & Terrace. Have very bad privies. Cavendish Street. No. 13 & 14 is a lodging house in the occupation of W F Helliers. There are 12 beds and sometimes 40 persons are lodged here who pay 3d each per night. The privy and cesspool are in the most filthy condition and the well water is turbid and positively green in colour. No. 23 and 36 are also lodging houses, equally bad. At the latter is a back yard about 6 feet by 12 feet and in this is a privy, a copper and a filthy outbuilding. Thomas Street. Has a lodging house with an opening through two party walls so Nos. 4, 5 & 6 are thrown together. Three rooms are furnished and let separately at 6d per night. The nine other rooms so let, are occupied by single women of the worst character. No. 11 and No. 14 in the same street are similarly occupied. Chesterfield Street. Nos. 5, 15, 16, 11 and 56 are also lodging houses with two or three beds in a room, some under lean-tos without windows, fireplaces or ventilation. In several incidences, the medical attendant, (Mr. Verral 3 Gloucester Place) assured me he had counted 17 persons sleeping at one time in one of these small rooms. All these lodging houses are subject to a low fever which be attributed to the bad drainage and fetid atmosphere. The Workhouse has several large cesspools, the contents of which are used to improve a large garden. "The Situations Where Diseases Prevailed,"
Writing that "The causes of sickness may be traced in the quantity of sulphuretted hydrogen, which arises from excrementious matters retained in the several cesspools throughout the town. This deadly poison pervades all the narrow breathing places which are found at the backs of continued rows of buildings, and where there are no windows so situated as to admit it into the overcrowded apartments. Nothing appears to produce greater debility, or to prostrate the energies of a working man, more than inhaling such an atmosphere. His wife and children are doomed generally the whole 24 hours, for weeks, nay months, to exist under its influence, and no means of escaping from it being afforded them, they are almost always on the sick lists, and either attendants at the dispensary or asking relief from the Poor Law Guardians." He found "Many of the houses are wretchedly damp, being constructed with inferior bricks and mortar made of sea sand. No methods are adopted for getting rid of even the pluvial waters, and the walls are covered with lichens so that, added to the want of drainage, a constant decomposition of vegetable matter is going on. The inmates of such houses, unable to endure the sensations produced by such an atmosphere, seek the imagined restorative in the stimulants of the public house, in total ignorance that a more effectual remedy might be found in a healthy habitation, in breathing early and late purer air, and occasionally taking a dip in the sea." 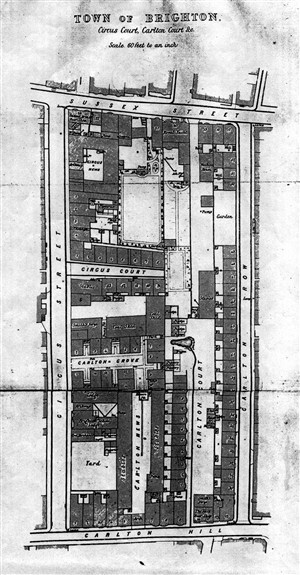 Cresy's map of Circus and Carlton Court for example, is reproduced above. The open drains that ran in front of the houses are clearly visible, and the map also shows domestic residences clustered around a large open cesspit. Undrained industrial establishments like forges, stables and piggeries can also be seen, and the local slaughterhouse just off the map at Riding School Lane has already been mentioned. Cresy was critical of the number of industrial buildings, workshops and facilities for keeping and dispatching live animals that were all located in Brighton's residential areas and was further appalled to find that these establishments frequently used local wells as additional cesspits, thereby polluting the subterraian streams that provided the householders in the immediate area with drinking water. He revealed that it was not uncommon for the water in domestic wells to be tainted with animal blood and sewerage, and that un-emptied over full cesspits in back yards often overflowed into them. Many of these cesspits were also found to have porous linings, allowing effluent to seep through where it then found its way into the basements of neighbouring houses. Cresy concluded, "The arrangement and construction of the dwellings occupied by the humbler classes is very defective and there is a total neglect of all that is necessary to contribute to the health of the inhabitants. When the small confined streets with the courts and the alleys which branch from them were laid out, there was evidently no consideration made of those important constituents of comfort, ventilation, drainage, or the supply of good wholesome water. Now these miserable structures are frequently so closely packed as to almost defy a thorough and effectual remedy." He recommended that, "... every cesspool and receptacle of decomposing matter can be removed and an arterial system of pipes with an abundance of water can be provided to maintain something like cleanliness and create a less injurious atmosphere around these habitations of a class whose ignorance of every natural law prevents them from perceiving what may improve their condition." There is little wonder that I find Edward Cresy's report on Victorian Brighton so fascinating, for his unique honesty was undermining the view being promoted by the starched collars that supervised the local media, who stressed that a move to the "so called," booming health resort of Brighton would provide the entire family with a far better way of life. Cresy's 1849 report suggests that this was certainly not the case for any of those who could only expect a low income. "The Cholera It was not to expected that whilst this fatal disease was raging the length and breadth of the land, that Brighton, salubrious as the as the air of the South Coast is, would be wholly free from the sickness: but it is very much doubted by gentlemen who have ample means of judging, we mean the most prominent medical practitioners of this town, that cholera has prevailed in Brighton at all, although reports have been sent forth in the Times newspaper, of returns of cholera from Brighton. It must be remembered in connection with the above opinion, that in 1832, when the cholera first visited this country, that whilst hundreds were dying elsewhere, Brighton, like Birmingham, had not a single case of Cholera. It is also worthy of remark, that Dr King (who really knows what cholera is, having seen numbers of cases in India,) should have stated at a meeting the other day, that he had not met with a single case of cholera in Brighton. Now we would seriously ask our young medical practitioners, who are making their returns to the Board of Health, whether they know cholera when they see it? They should be cautious in making their returns for they know not what injury they do the town." It should be noted here that when a Cholera outbreak was confirmed in Pyecombe a month earlier, Dr. King was amongst those reported to be in attendance. The newspaper report finished with what I describe as "The Closed Shop statement"
" ..... We question also very much the propriety of bringing down a medical staff from London. Surely we have gentlemen of eminence enough in the medical profession in Brighton, to form a Board of Health here if required, without running post haste to London for medical practitioners whose interests are not mixed up with the town of Brighton. ..........."
Had local officialdom not read or understood the full implications of Cresy's all too recent report? I have just sent for my great great great grandfather's death certificate and found that he died of cholera in Brighton in 1854. He was the baker at the Brighton Workhouse. Your information has helped me understand the terrible conditions that led to this. I found this very interesting as my grandfather,great grandfather and great great grandfather lived in Essex Cottages, Crescent Cottages and Egremont Street between 1851 and 1891. It has helped me understand a bit about how they lived. Fascinating to read about the conditions my ancestors lived in. Have just purchased a death certificate for my G G Grandmother's death in 1849 Ann Isaac. Woburn place. Died of Cholera. Aged fifty nine. Hardly surprising reading this report!! Likewise, two death certificates of possible relatives of mine: Bartolomeo and John Raggio show both dying of cholera within three days of each other in 1854. They were aged 20 and 21 and lived on Thomas St..no. 14. The 1851 census shows most of that road as "lodgings for prostitutes or lodgings for tramps" . Ah! A where's where of my Brighton Ancestors. My ggg-grandfather died of Cholera in Little Pimlico in 1849. The family moved there when forced out of Petty France, and moved to the Albion Hill area when Pimlico was demolished. I found this page when trying to locate Richmond Square. Does anyone know exactly where it was?